Rosalía is 43 years old, married, and lives with her husband and two children in the centre of Enrique Lopéz Albújar, a small village located in the city of Chiclayo. For the last 15 years Rosalía has had a small stall in the José Balta market, located in one of the principal avenues of Chiclayo. She works there every day as a seamstress to support the economic upkeep of her family. Although she works principally from orders, she also makes various items of clothing which she later sells to her customers. She invests the fruit of her work in more material to continue making clothes. 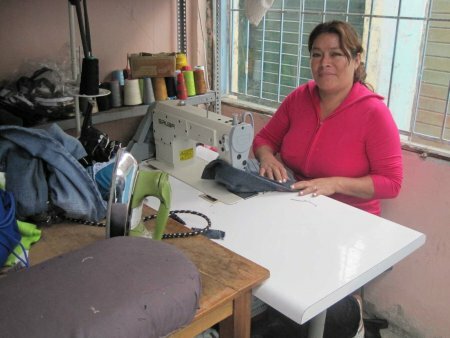 Rosalía's greatest wish is to build a workshop where she could just concentrate on making clothes, and as her business grows, employ other women who, just like her, share the same need to work and the necessary aptitude and creativity to progress with this type of business. Both her children are currently studying and the desire to give them a better future motivates Rosalía to continue fighting to achieve her dreams and keep her family going. For this reason she is applying for a loan of 1800 nuevos soles which she intends to invest in more material to continue making items of clothing. Rosalía has already worked with Kiva's partner institution for 3 years and has demonstrated punctuality and responsibility in her repayments, for which she is considered to be a good client.